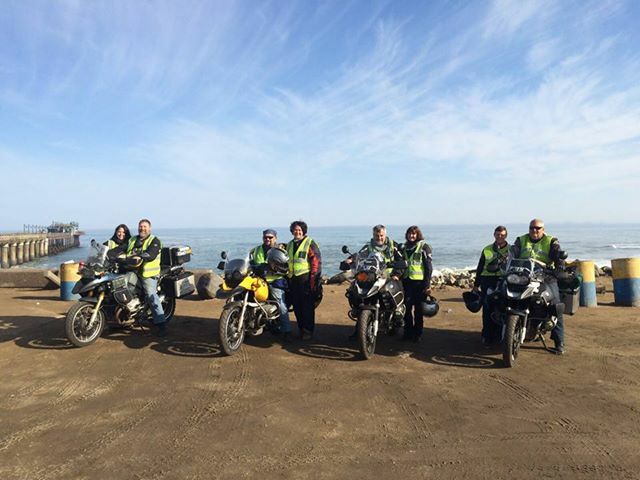 Our Motorcycle Tour was moving along so nicely! 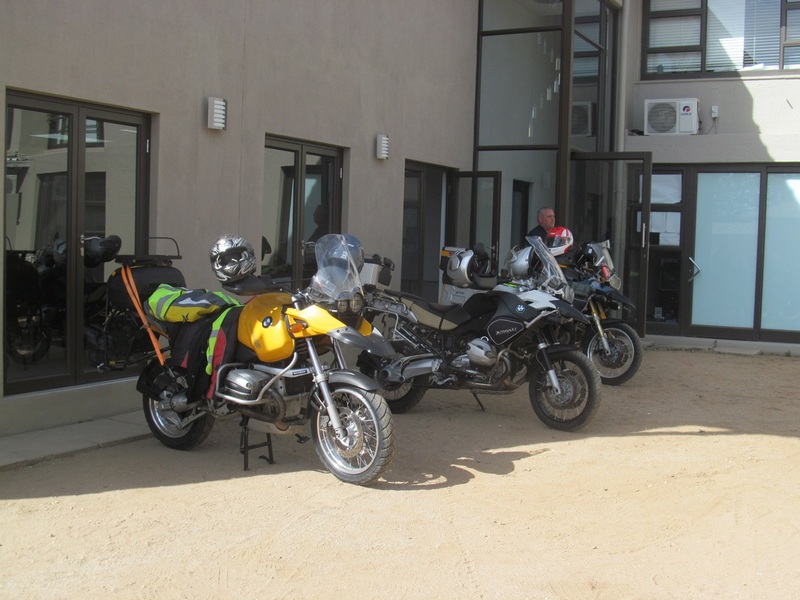 When we left Windhoek on that morning, we still had four days of riding ahead of us. Or so we thought. 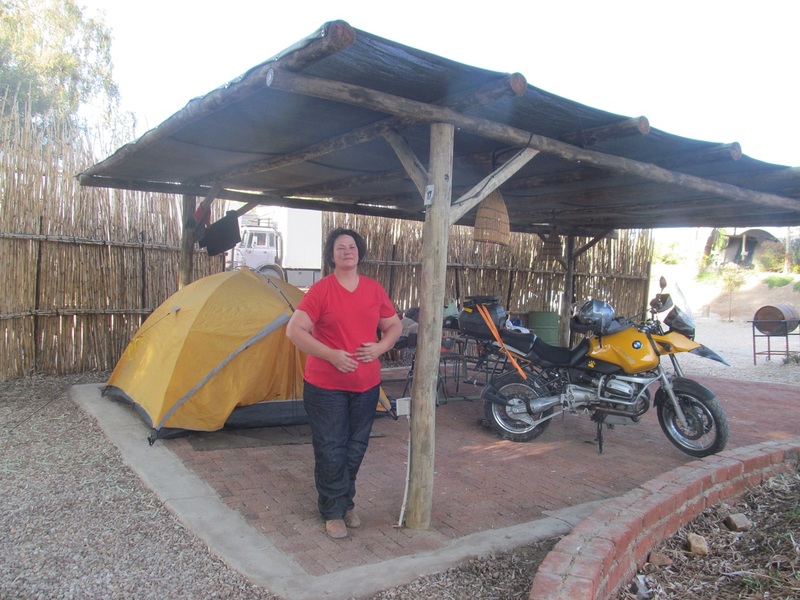 From Windhoek we had to go to the Border post of Buitepos (Outpost in Afrikaans) where we would camp before crossing back into Botswana. And that morning we left with a song in our heart. 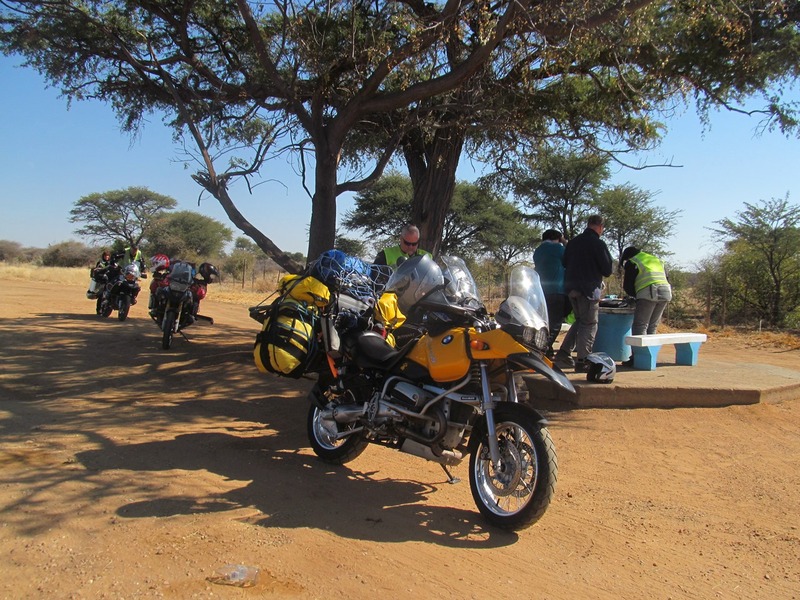 It was a beautiful day, and such lovely riding out of Windhoek, pass the International Airport on the road towards Gobabis. 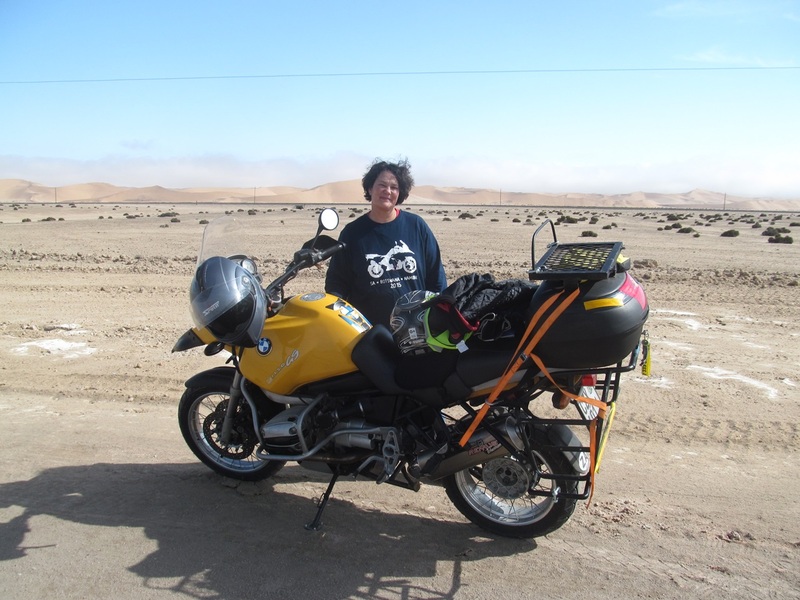 The other 3 bikes had to continue the journey the next morning, and we felt really heartbroken. 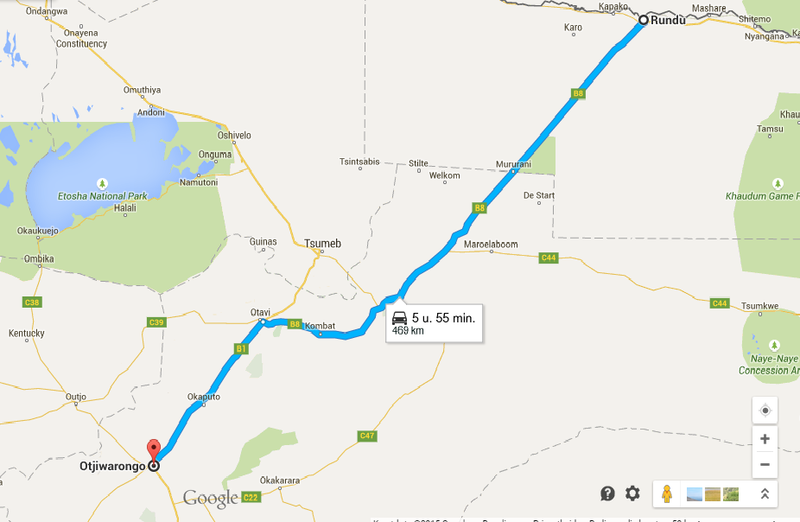 Some options included that some people of Gobabis could come and fetch us, and order a new seal. 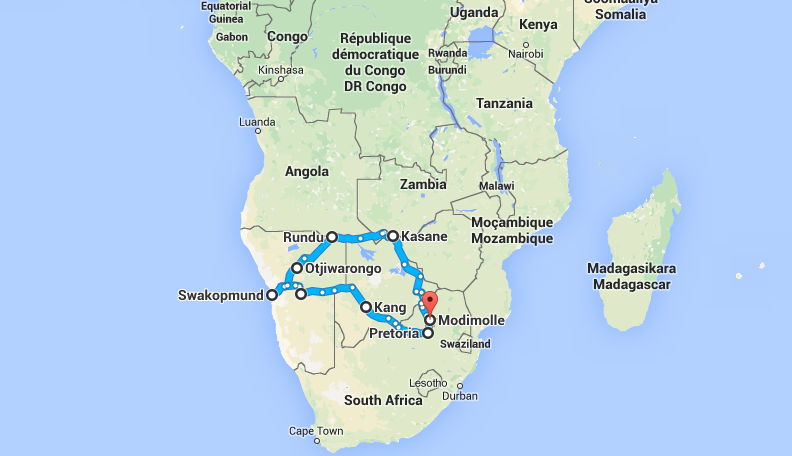 We also made contact with one of Namibia’s trucking companies, which have lorries running empty to South Africa. But they could not say when the next lorry would be passing here. The passenger busroutes to South Africa do not pass here. That evening I was really worried, not knowing how to get my wife and my broken bike back home. The next morning three trucks of Absolute Logistics stopped at the shop, to buy some food before crossing the border. Someone of our group asked if they could help us, and they phoned their head office in Windhoek. 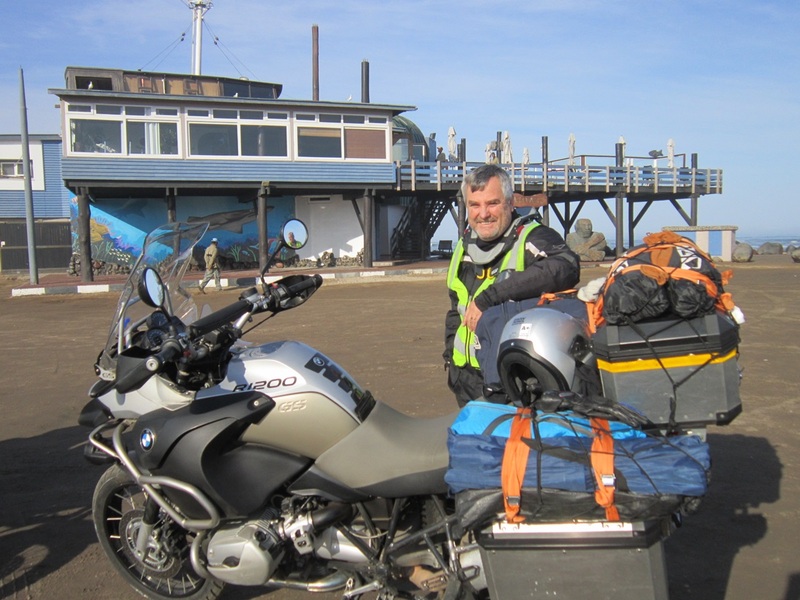 They got the green light, and so we had to quickly get the bike, and all our luggage aboard… it took some muscle to get my bike onto the lorry! And so, after a lot of worries, my wife and I were on two different lorries, going on to Pretoria. We had to ride in separate lorries,as each could only take one passenger. We left Buitepos at half past 8 the morning, and had a long, long day in the lorries, driving at 80 km/h through Botswana. That evening at midnight we arrived in Pretoria, where our young colleague came and picked us up. 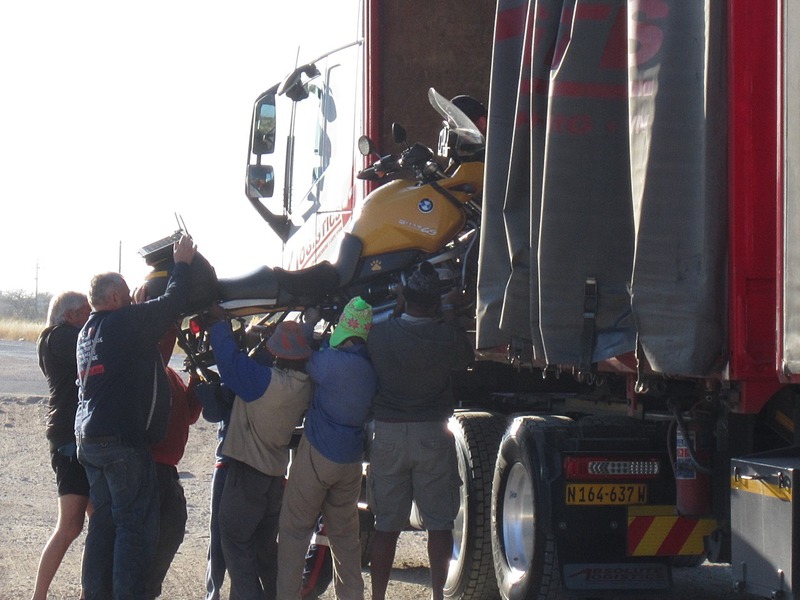 I went to fetch my bike the Monday morning, at Absolute Logistics’ depot in Boksburg near the International Airport. 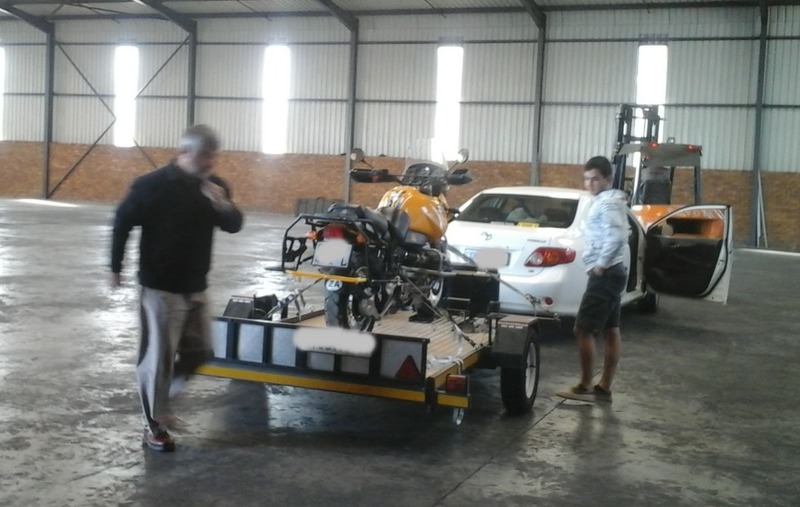 I took it to Dream Adventure Motorcycles in Pretoria. Mark there opened up the Drive Shaft, and saw what happened. 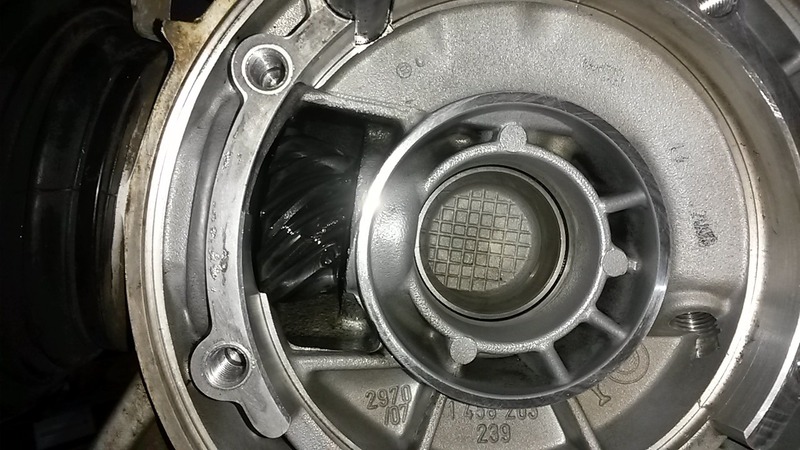 The main bearing has disintegrated. In the process it took out the crown gears, and damaged the whole housing. It is two weeks later. It took a while to get a secondhand Final Drive to fix my bike with. I only got a part yesterday, and some time in this week my bike will hopefully be fixed again. So our tour ended three days early! 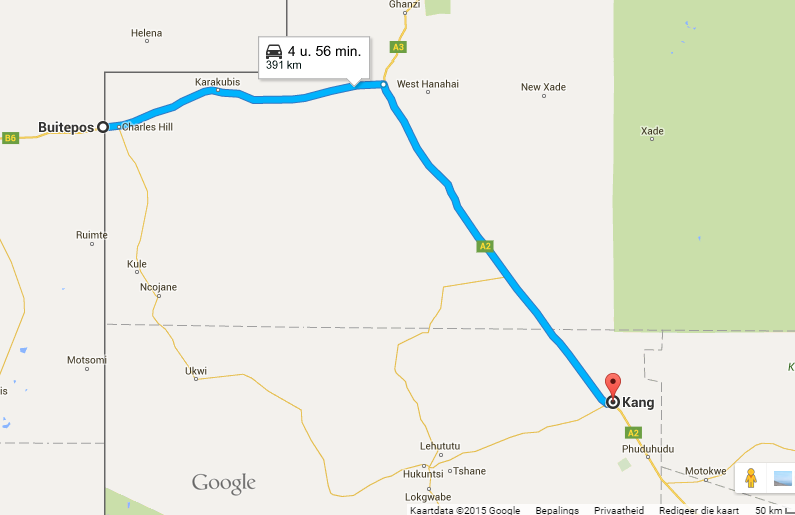 The others drove on from Buitepos to Kang in the centre of the Trans Kalahari Highway. They did this route without incident. 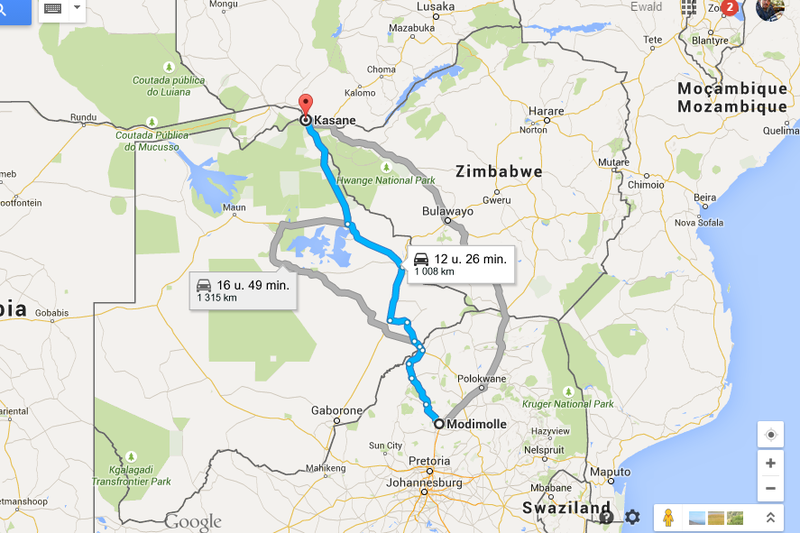 If you ride this route, be very sure where you will find fuel, there is only about 1 fuel stop on this route! 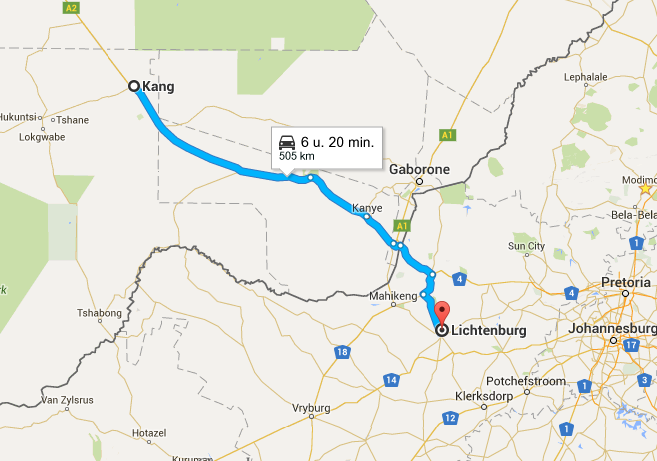 And only two of the bikes made it to Lichtenburg and the Guest House we were all looking forward to. We did complete 80 % of the planned route, and we did see some amazing sights along the route. 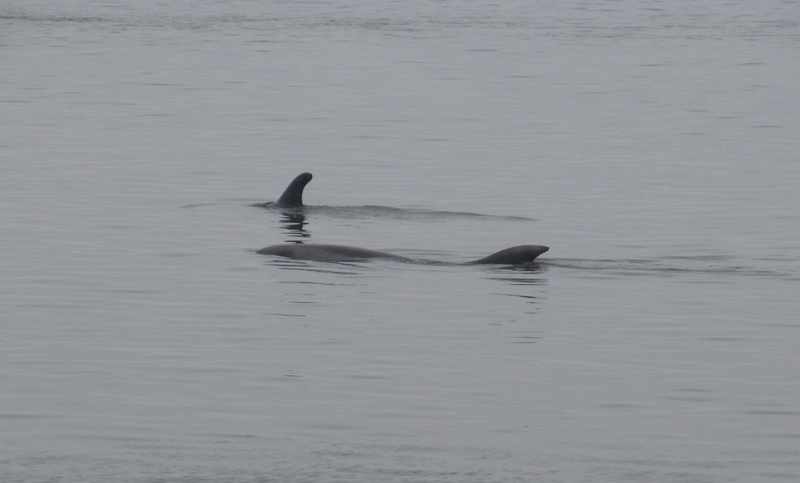 We had some amaing friends riding along, and that made it such good memories to treasure. So that is the end of this ride report. Thank you for travelling along! 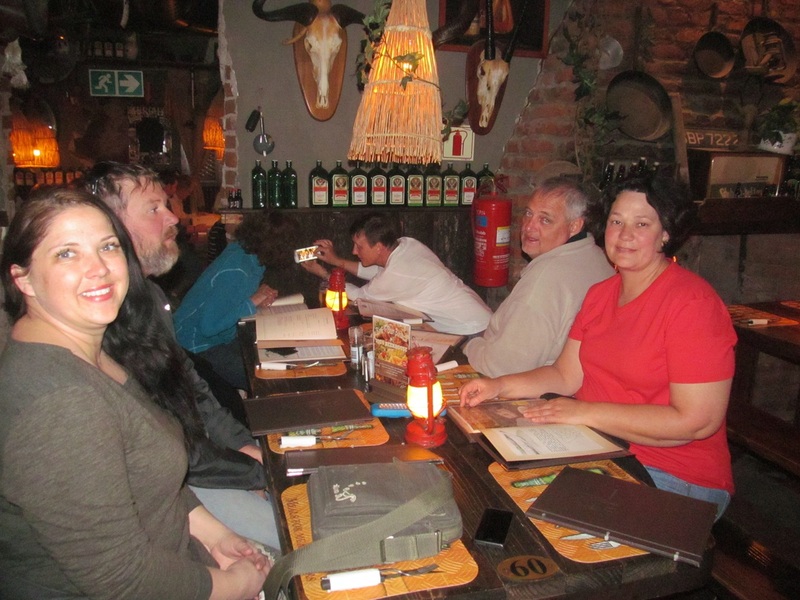 From left to right: Elaine and Richard, me and Annelie, Francois and Andrea, Magda and Johan. When we passed Aranos, the wind became more gentle. But it was still a hard day on the bike. 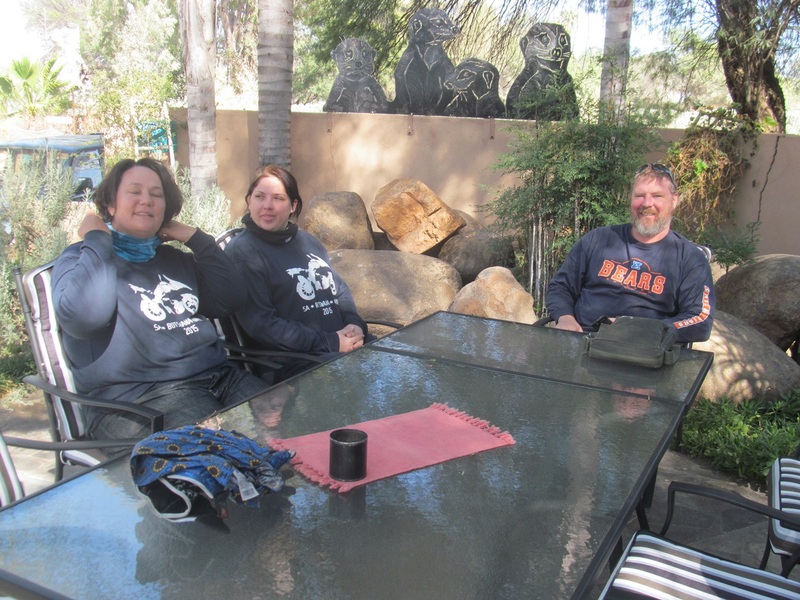 We stopped at Okahandja at a Biltong factory, where we had some coffee. Biltong= the Americans call it beef jerky- wind dried raw meat. I see the old team of Top Gear did not like it. We in some of the harshest parts of the world love it- it was a way to preserve meat in a hot climate long before we had fridges and freezers. 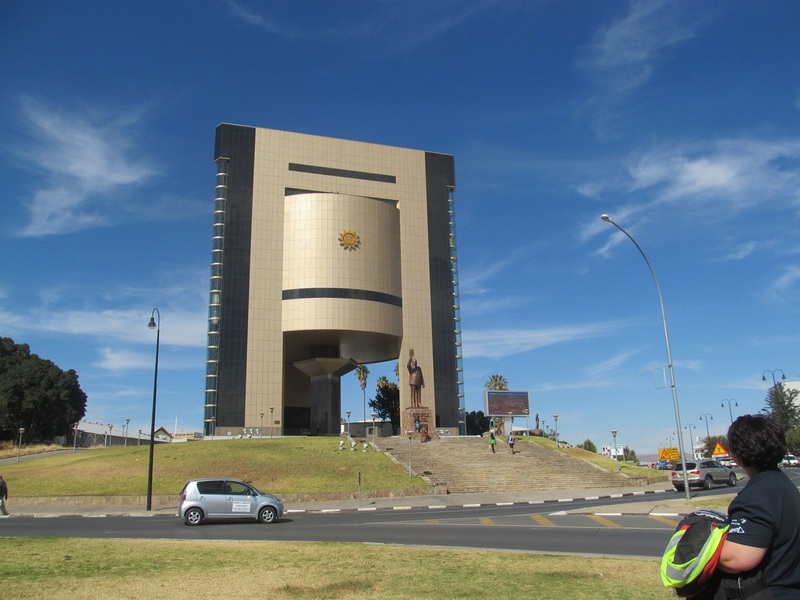 When we arrived at Windhoek, we found that we have pre-booked at an excellent venue! We stayed over for two days at Urban Camp- just check out their website! It was lovely. You get to pitch your tent on pavement, underneath a canvas awning. The bathrooms are hidden behind reeds, but it is modern and very well planned. To combat Southern Africa’s electricity woes, they were also busy installing some wood fired geysers to provide hot water. 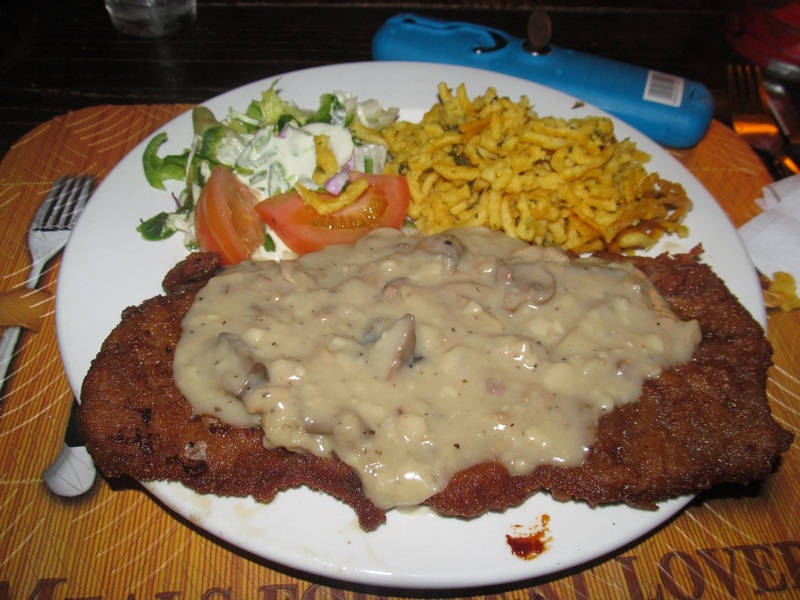 That Oryx Schnitzel was really good! Afterwards we all had an appointment at the Namibia Bible House. 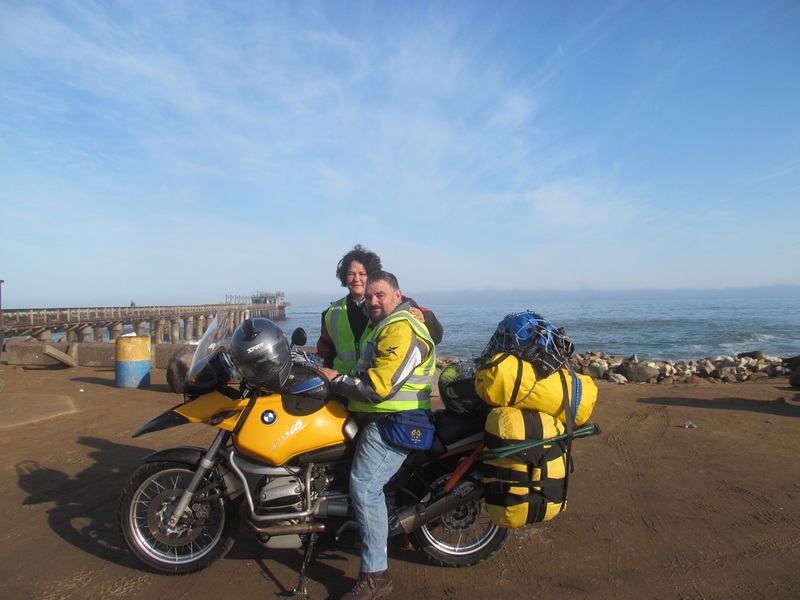 We all are part of the South African Word Riders movement, which is organized nationally by Francois. 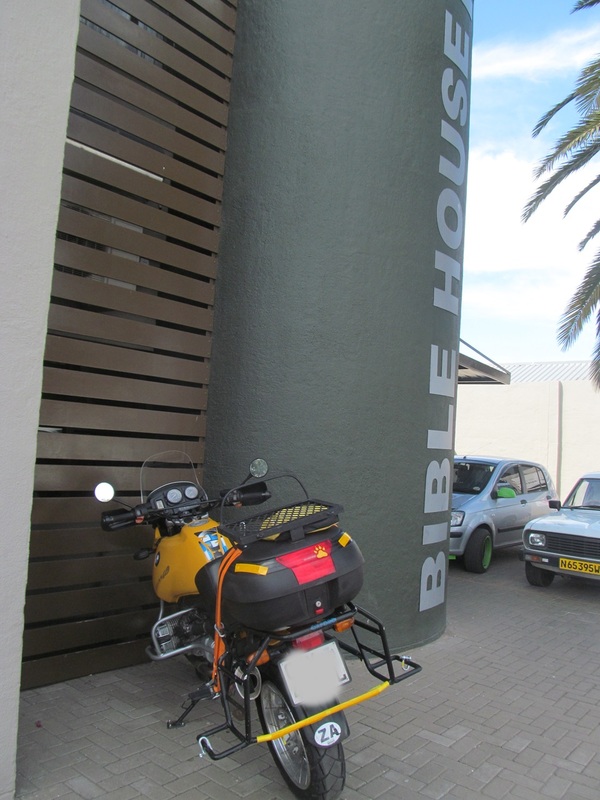 So we had a visit to the Namibian Bible Society, and a briefing about what we do when we go out on Motorbikes to visit Schools in South Africa. 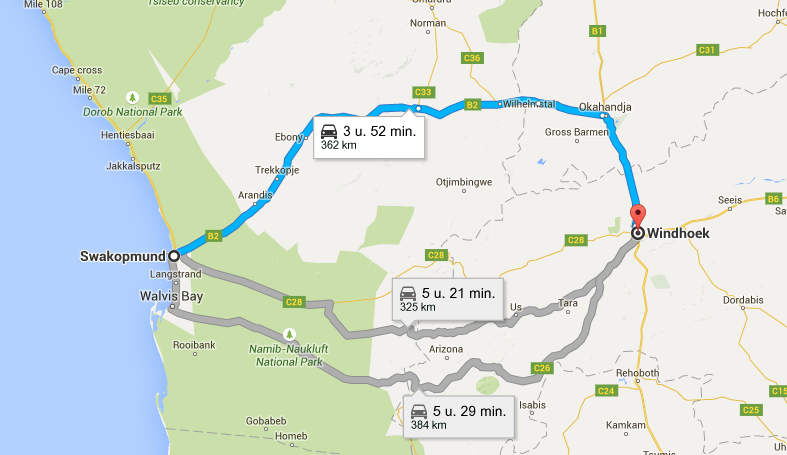 After finishing these visits, the traffic of Windhoek started to get me under. The locals are not very motorbike friendly, they will not give you a gap to enter traffic, and some aggressively try to push you away to gain space for themselves. 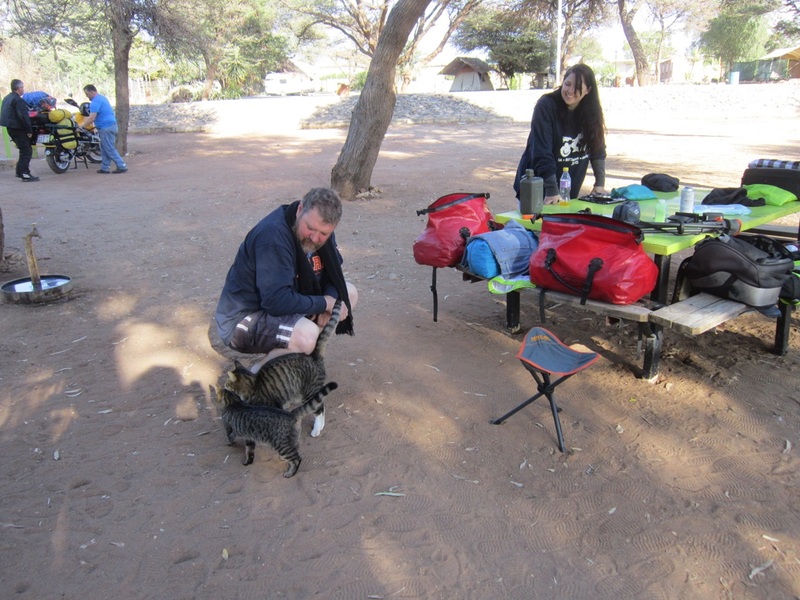 That evening we did experience some genuine Namibian hospitality, when Barney and his wife (He is the manager of the Namibian Bible Society and she is a local pastor), invited us to dinner. 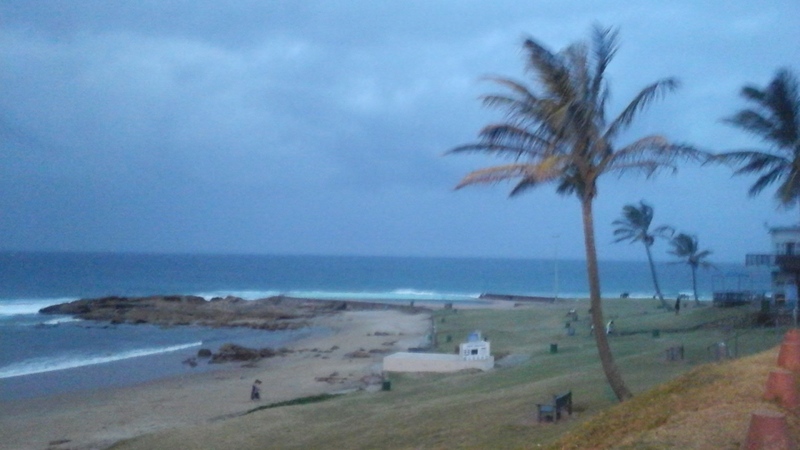 We had a beautiful evening around a BRAAI (Barbeque). Again I had some Oryx meat, which I really enjoyed. We had a good evening filled with good food, wine and laughter. And then we had to go off to bed. 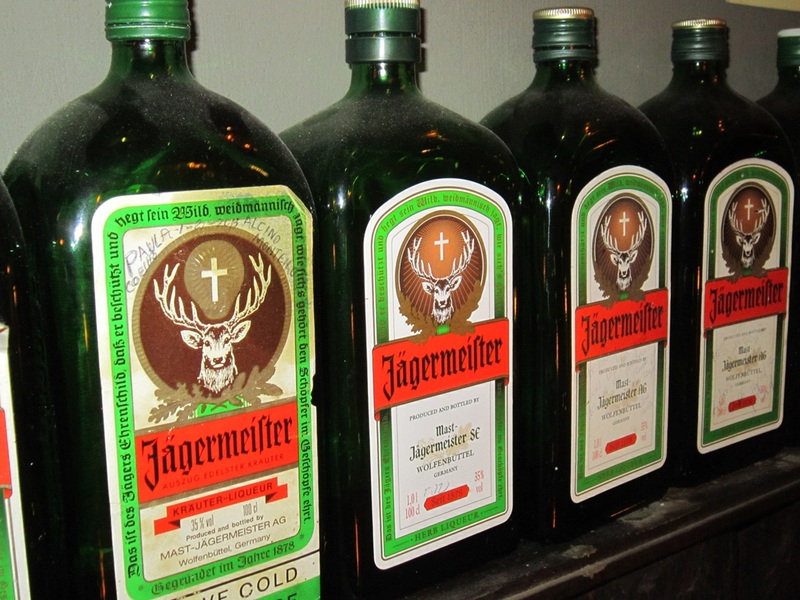 Little did we know… to prepare for the NEXT day. I enjoyed Urban Camp and Joe’s Beerhouse a lot. 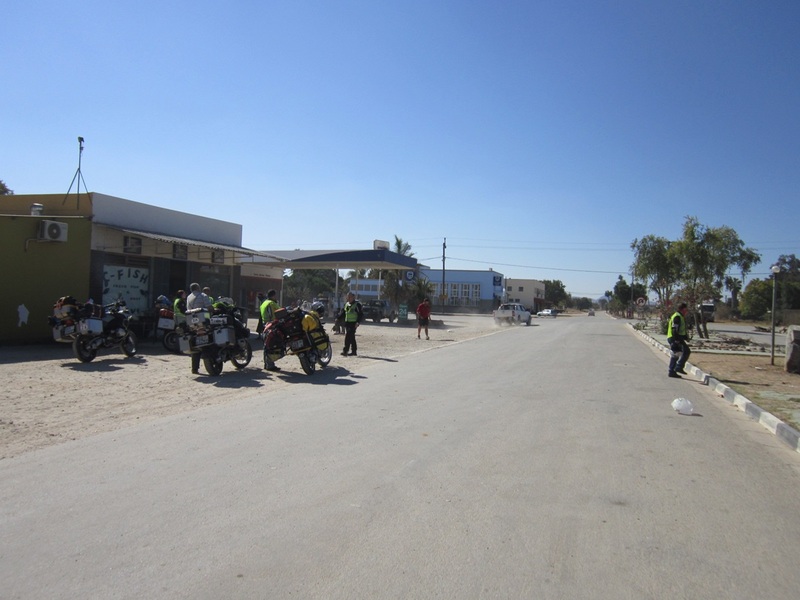 Windhoek might be a special city, I did not feel safe in the traffic on my motorbike. When we woke up on Sunday morning, the whole town was covered in fog. 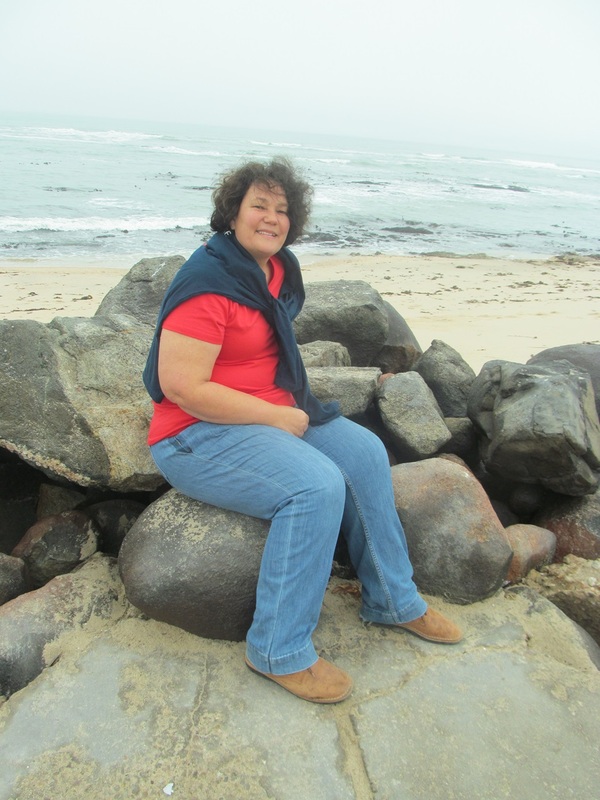 My wife and I decided to walk through the beautiful town of Swakopmund in the fog. One huge bonus of staying at the municipal resort- we saw a laundromat next door, and we gladly handed them our first week’s dirty laundry, to be washed, dried and picked up at six. But turning a corner in the main street, we saw a delightful sight- a small restaurant/ coffee shop, Bojo’s, with open doors! And the smell of freshly brewed coffee just invited us in. So in we went, and first had a beautiful cup of coffee, and afterwards a most memorable breakfast. They had excellent wifi, I was really, really impressed with Bojo’s! 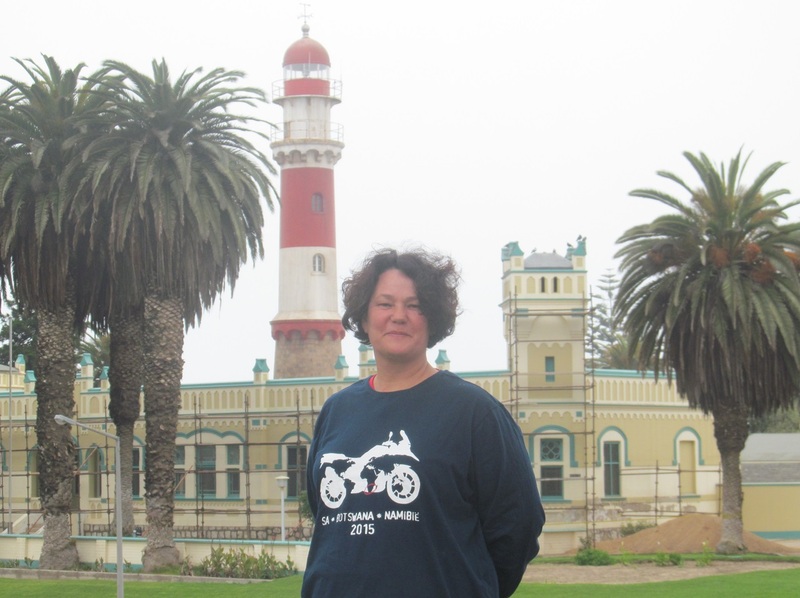 After this breakfast we just walked around town for hours, enjoying the sights of Swakopmund. 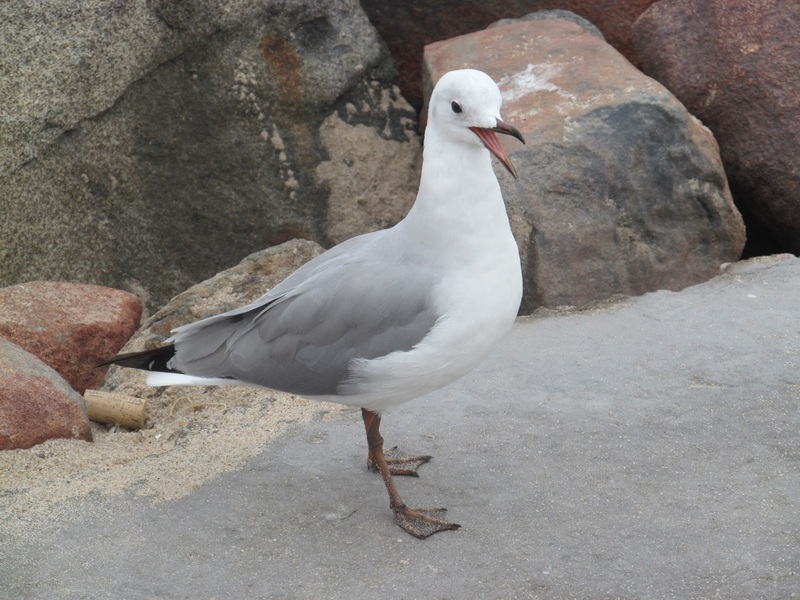 Here are some of the scenes of our flaneur…. 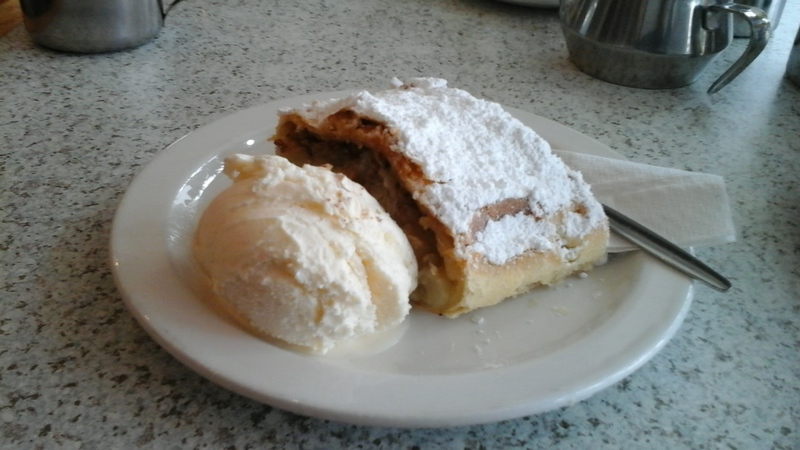 Is that not heaven on a plate? After this delicious stop, the weather was clearing a bit. So we went back to get our bike. 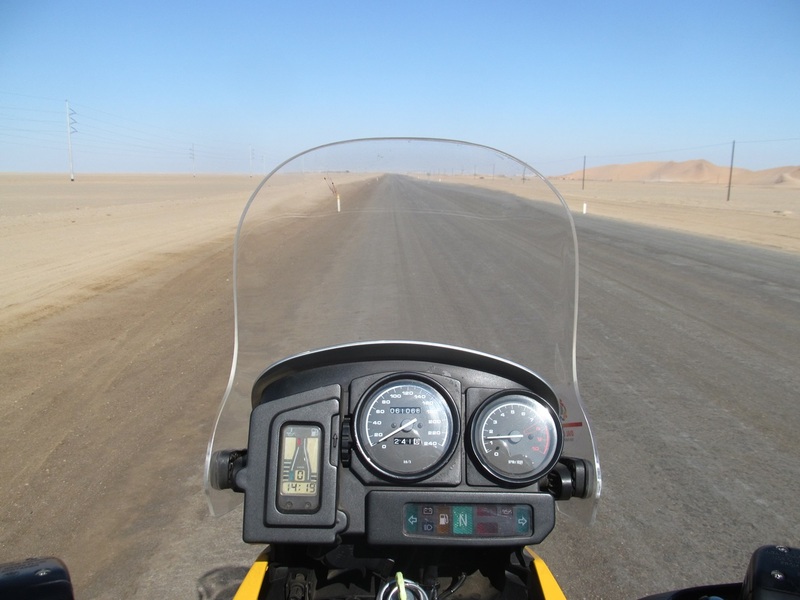 We decided to ride the Salt Road that runs behind the first ridge of dunes to Walvis Bay. This road is just gravel road, covered by salt. 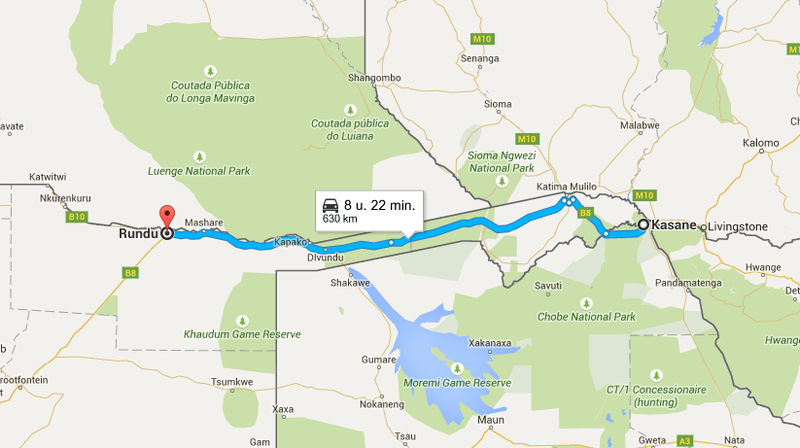 It is as smooth as tarmac, we could run on it at 120 km/h without any problems…. 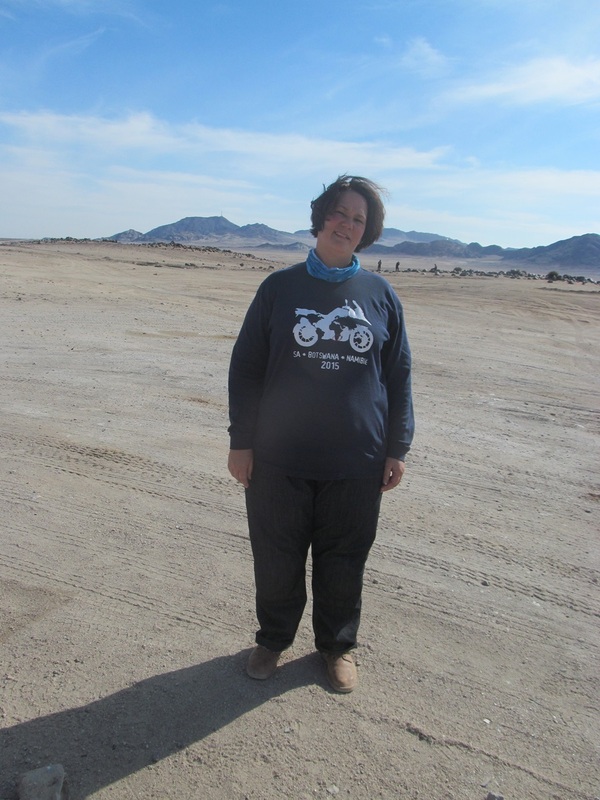 a beautiful ride in the desert! No, not going to take photos at 120 with my wife on the back! This road goes to Dune 7. It was also on my Bucket List (#51) years ago to climb, because you have a really hard time getting to the top. It looks small from here, but it is one of the highest sand dunes in the world. 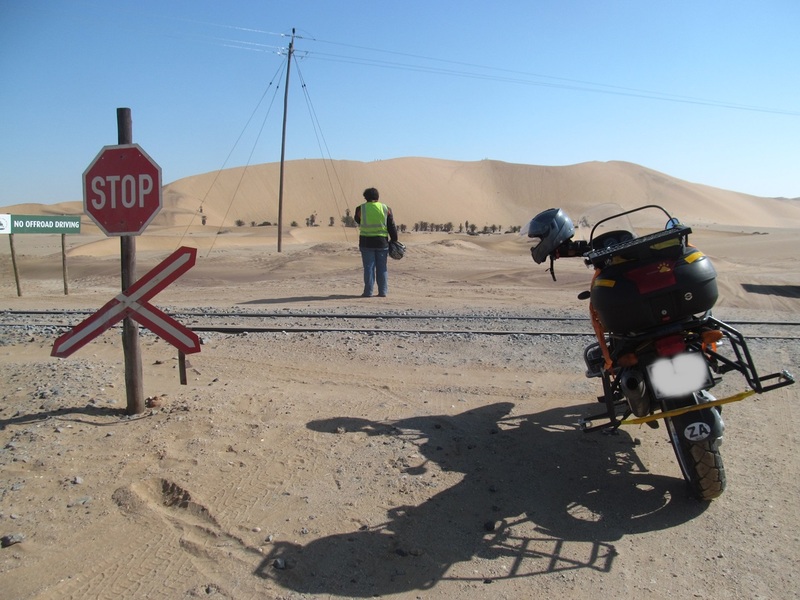 We did not ride up to the dune because of the extremely sandy road on the other side of the rail. 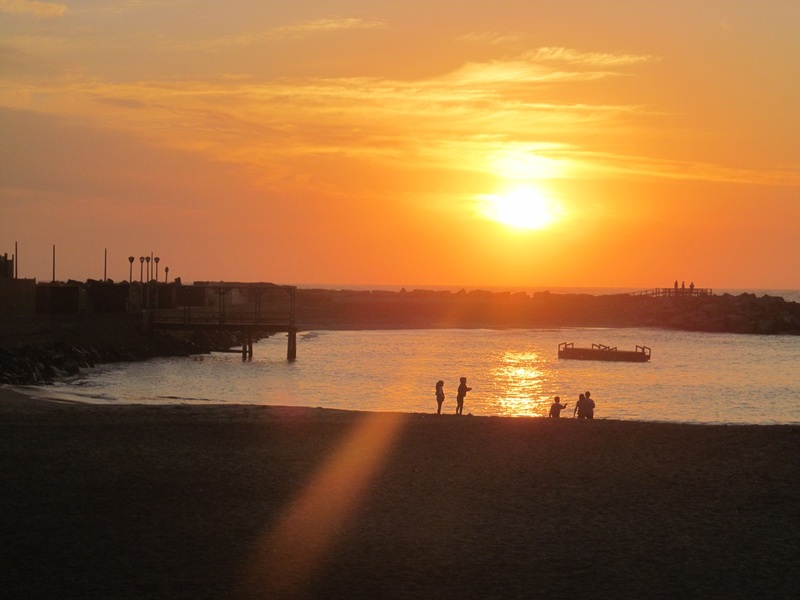 From here, we turned to drive into Walvis Bay, Namibia’s main port city. And it looked like a scary movie when we approached it. While in the desert there was no fog. 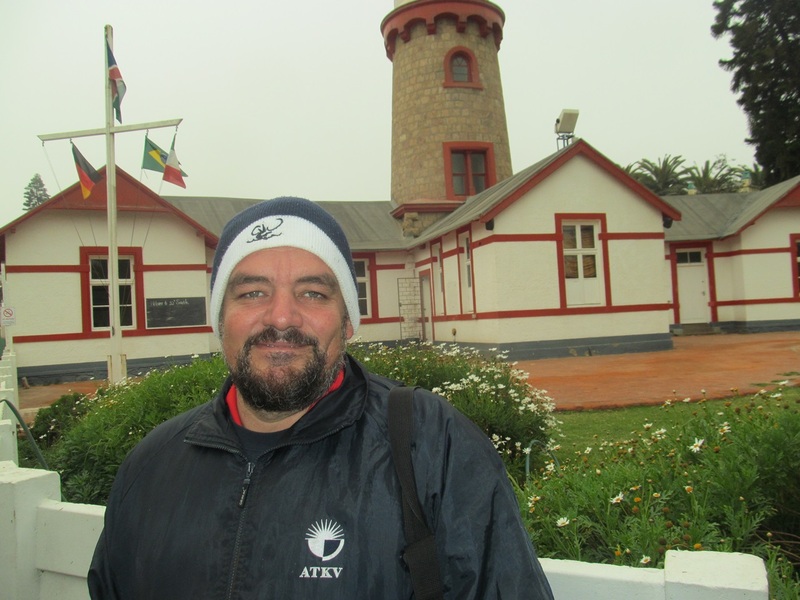 But in Walvis Bay the Fog was hanging over the town menacingly. I expected eery music to start up, and zombies to start walking towards us, maybe I watched that one episode too much of Walking Dead with my kids. I remembered Walvis Bay as a stinking industrial place from my first visit. There are a lot of fishing industry companies around here. 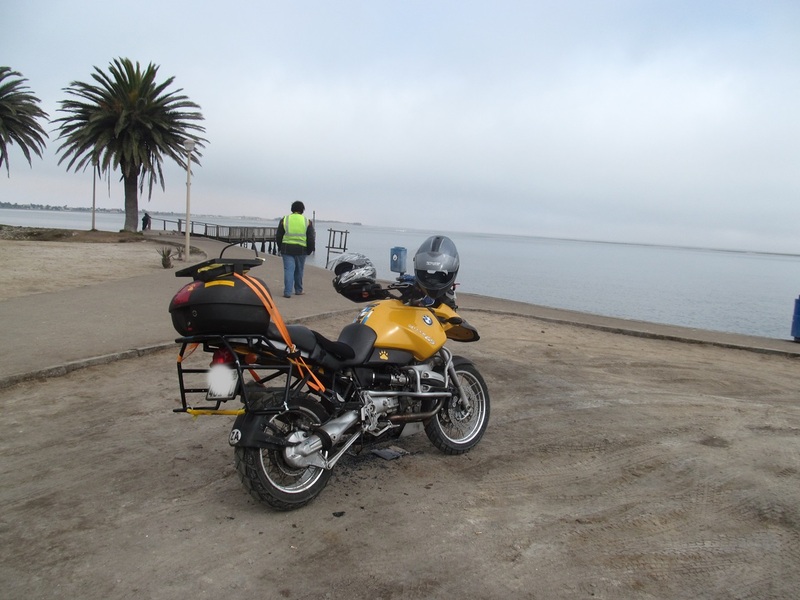 But riding around this place, I saw I was also wrong, There are beaufiful parts of Walvis Bay, where I would live any day if given a chance. 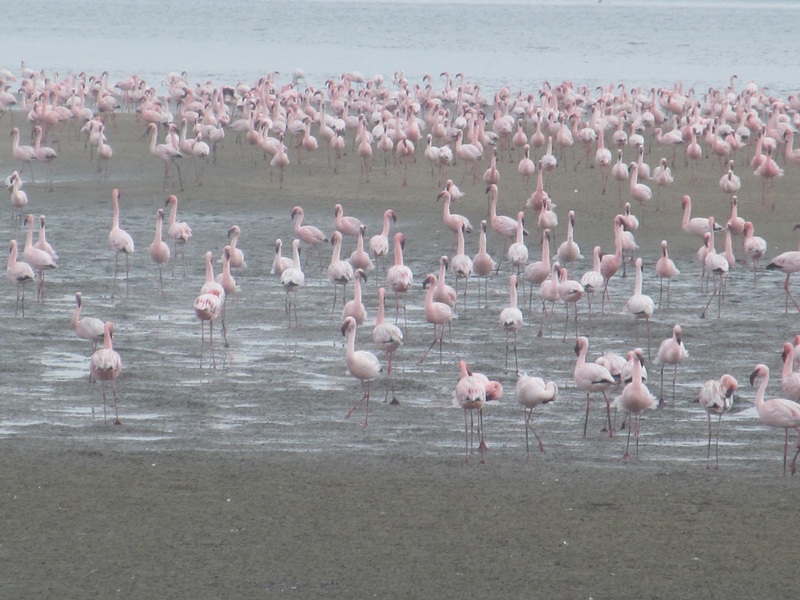 It is also known for the millions of flamingoes walking in the shallow water of the beach and estuaries. 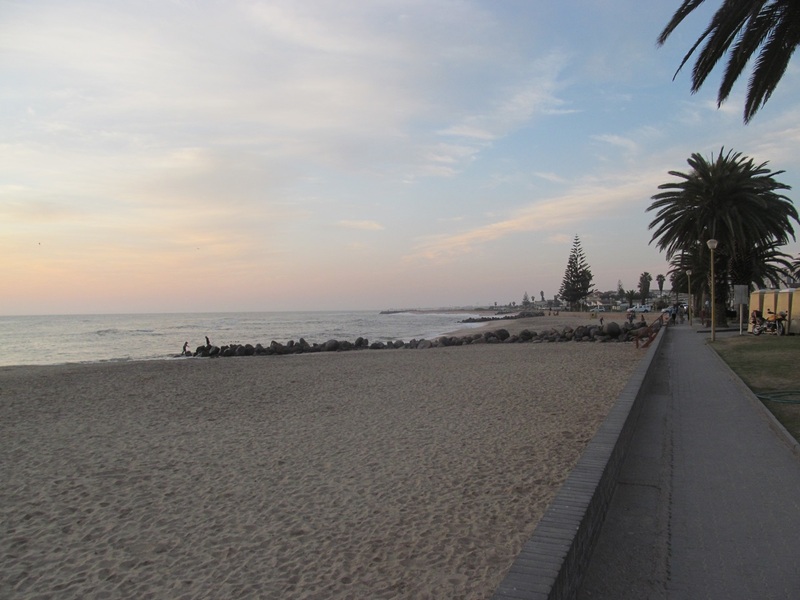 Swakopmund will always be one of our very special places in life! I grew up in an era where South Africa still fought an unpopular war in Namibia. Since I was very small we heard the names of Army bases in old South West Africa, where “our boys” were fighting the “communists”. I am not going to be drawn into the politics of that time or war. 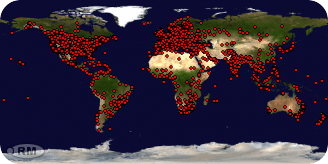 My only point is: I have heard of these places since very small, places where some of my age men have fought and died. 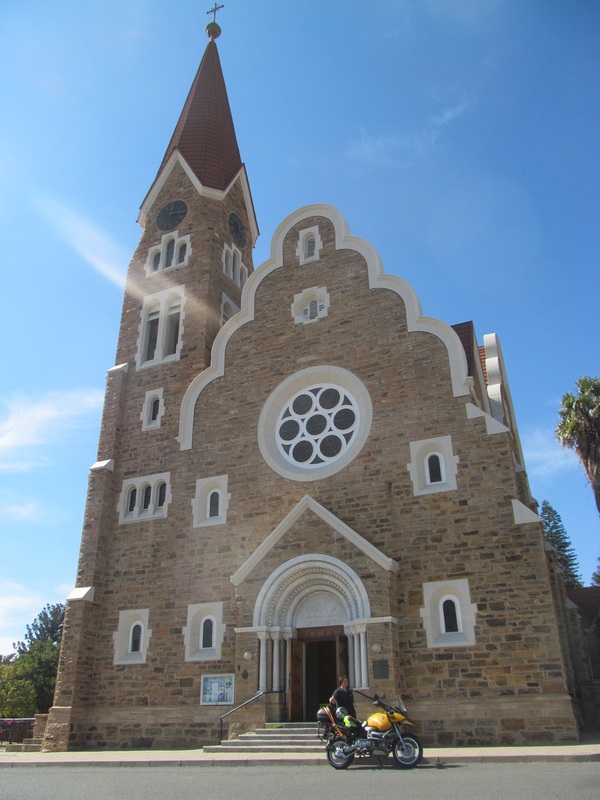 On this day one of our first stops was in Grootfontein. That is the sight where one of the main Airforce Bases were, where the troups who flew up to the war zone arrived. The place holds a lot of memories for my age and older South African men, of arriving, or of seeing friends leave in body bags. South Africa left here in 1989, and we were still not welcome at the airfield, we were escorted out of the place till we reached the main road. We put together a quick lunch from a supermarket in the brand new mall in Grootfontein. 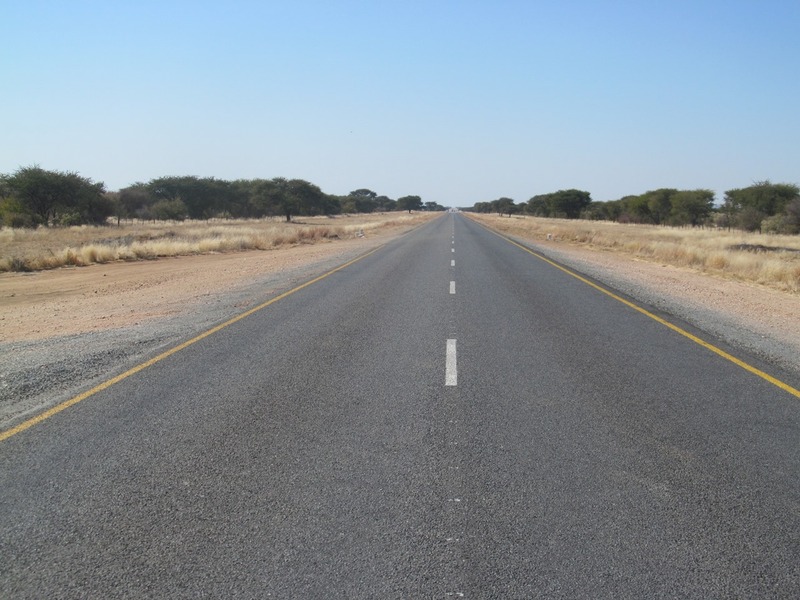 And then we hit the road to Otavi. 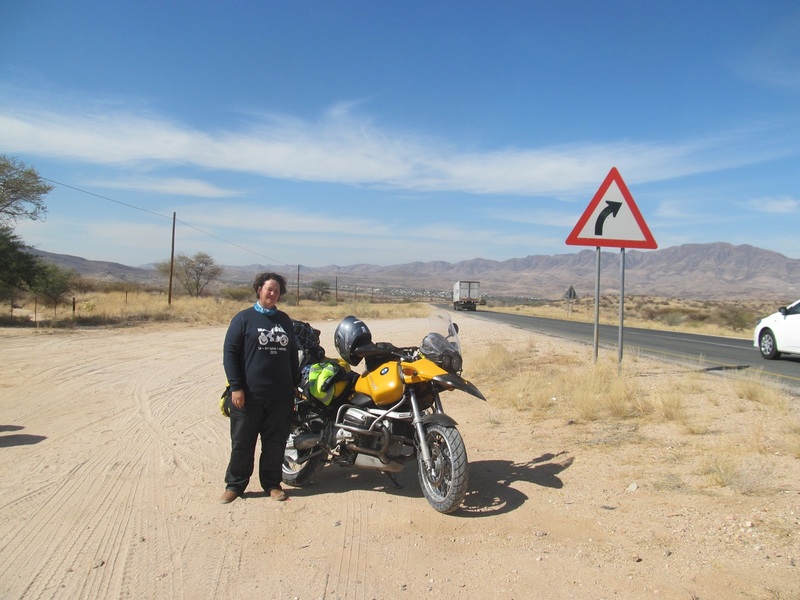 It is a beautiful ride to Otavi, passing a beautiful range of hills. It is also the sight of some mining activity. 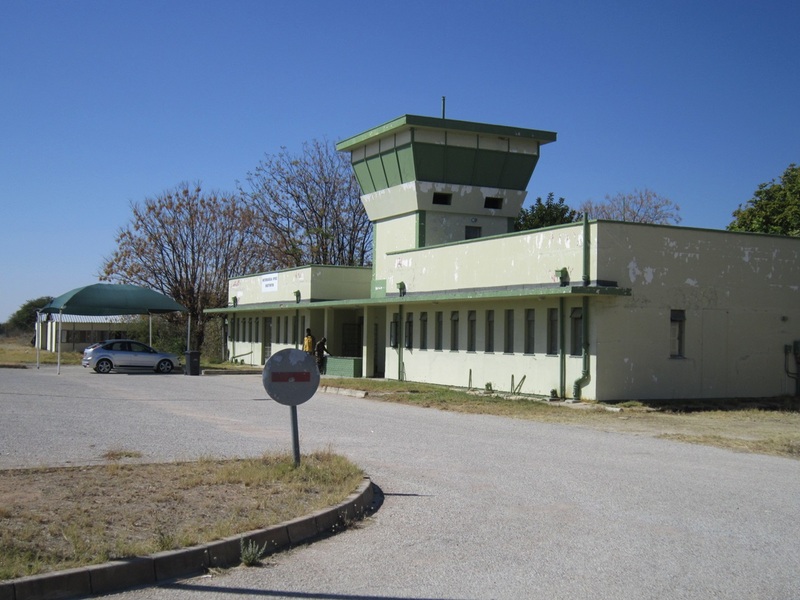 Otavi was a base for mechanized infantry in the war, and is now just a sleepy little town. It was Friday, Payday at the end of the month. 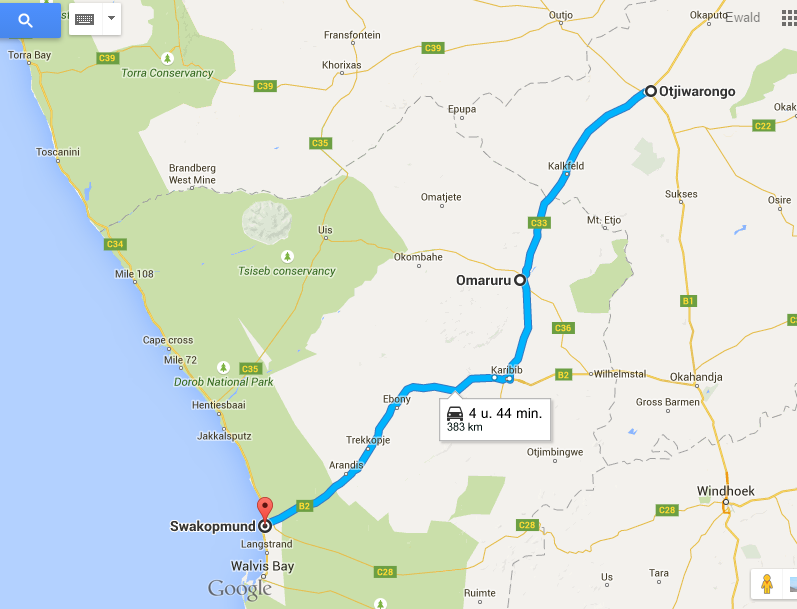 From Otavi we headed to the beautiful town of Otjivarongo. 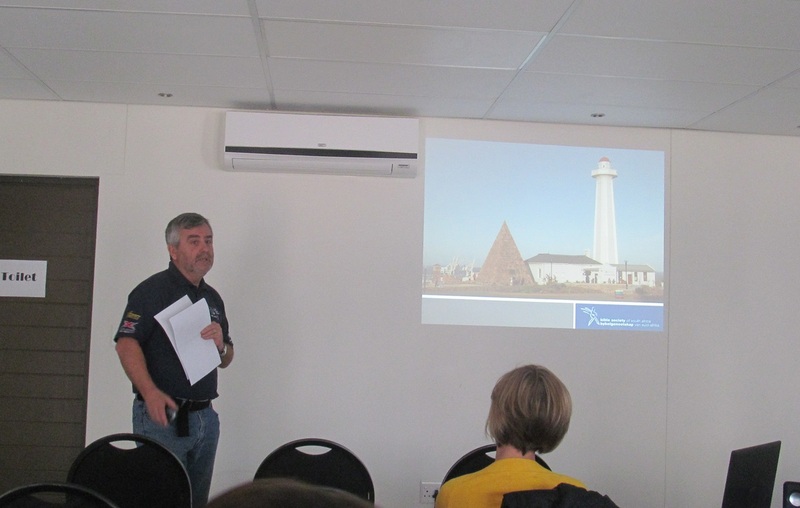 Before the tour our leader spoke to the young pastor of the local Dutch Reformed Church. She said the camping resort in town was not too bad… So we headed to the Acacia Resort in town. It was affordable, but that was about it. There was at first no hot water, and some broken taps in the bathrooms. 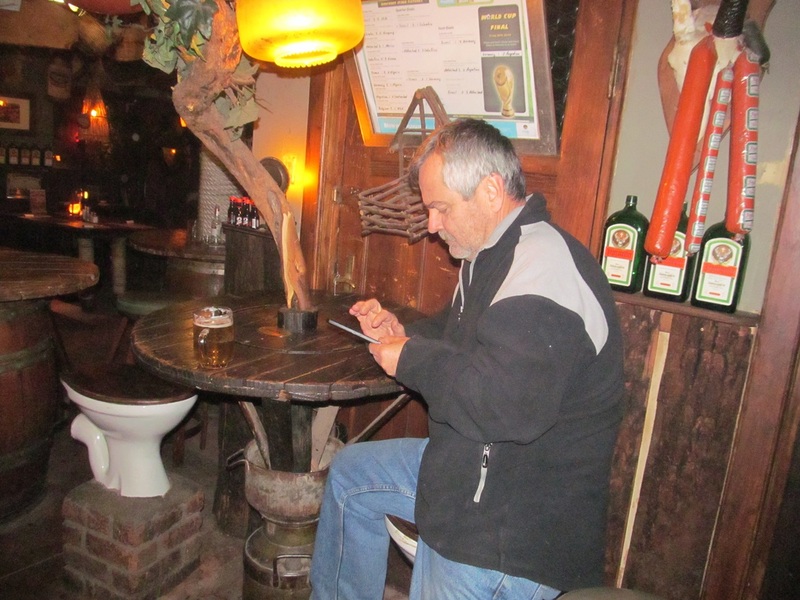 The owner blamed a tour group from Gauteng for the state of the place… but it looked a bit more neglected than that. The Camping site is just plain sandy, and far from the bathrooms. Hot water was at first not available, and after fixing just scalding hot. On the other side of the Resort’s Pub there is a Charismatic church, that with a loud sound system had a battle with the devil till midnight. And on the other side of the resort the devil was answering from a nightclub, cashing in all the paychecks of Otjivarongo, and belting out hard music till about 5 o Clock the morning. 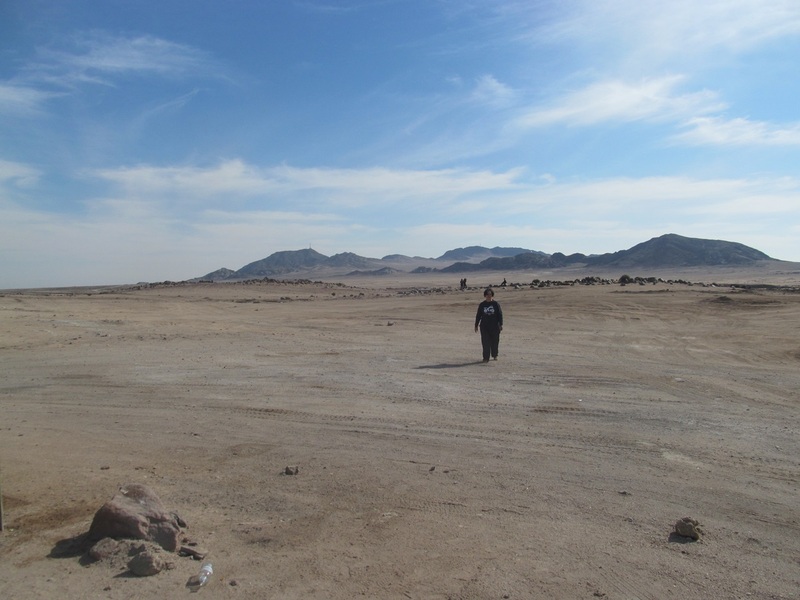 So yes, the Acacia CAmpsite is also not our best memory of the tour. But the town itself was not bad. They also have a very nice Wimpy with wifi available. On tours like this we don’t see elephants and beautiful trees every day. Some days are hard, some camp sites are really bad. But we need these days too to reach some excellent destinations, just like in life itself. We just had to go through days like these… And it is part of the story, and good memories afterwards. You will just see- I took very few photos in these stretches, just not that much to see then. But from Day 8… keep on watching this space! PS- I only now started realizing most people in the civilized world will have no clue to where in the world we are. 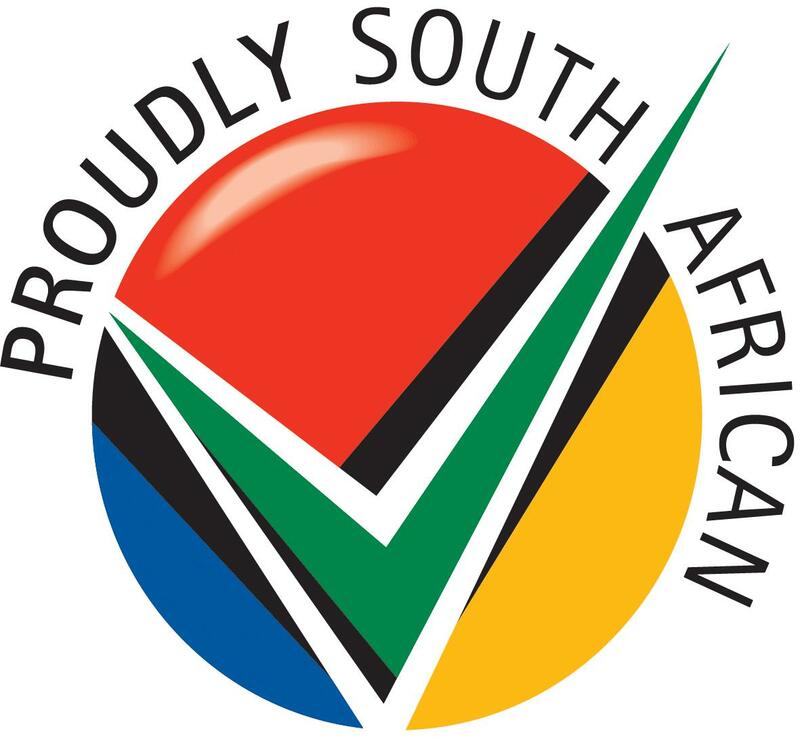 So just to bring you up to speed- I live in Nylstroom, which is 130 km North of Pretoria, South Africa’s capital. Of this day I have taken nearly no photos. Except the morning when we spent some time just sitting and enjoying the splendor of the view of Popa Falls…. We just needed some time to regroup after Johan’s fall. 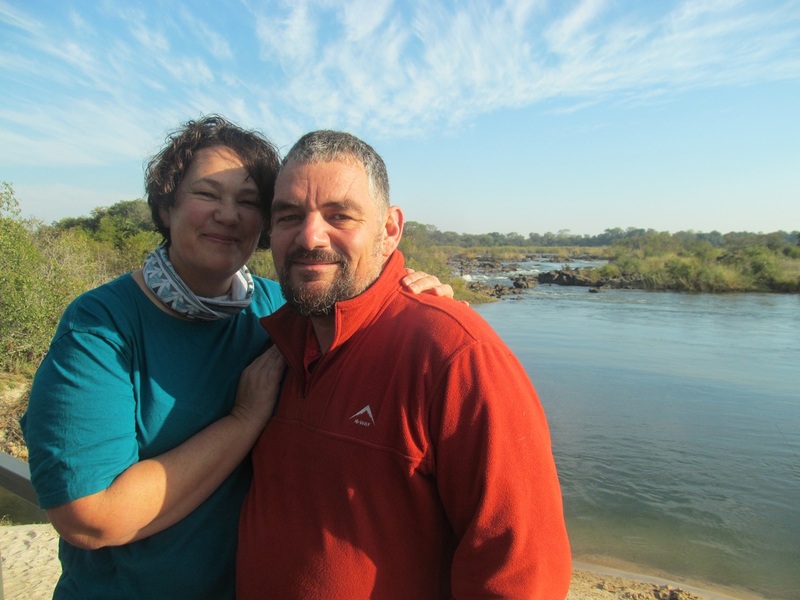 Johan and his wife was picked up early that morning by one of the notorious minibus taxis of Africa, just before sunrise. 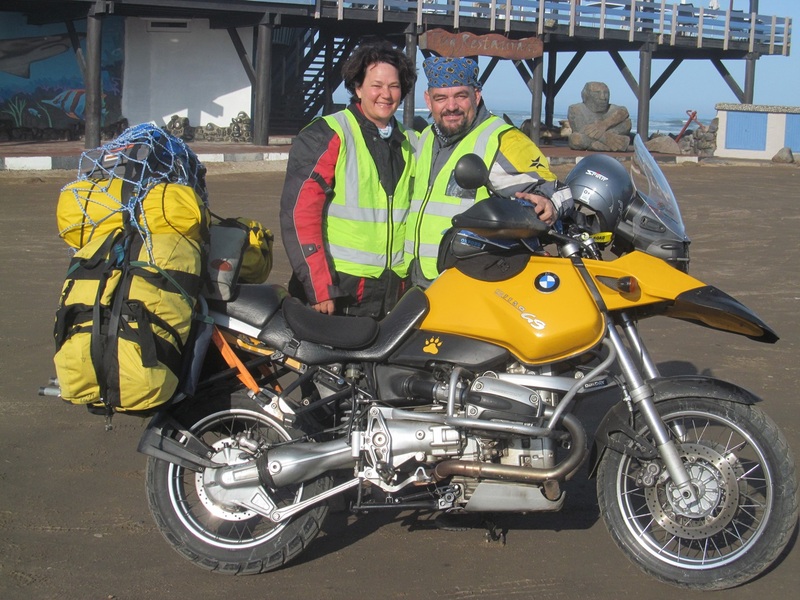 They brought along a trailer, and so Johan and Magda went onwards to Rundu, where they were dropped off at an engineering works, that fixed Johan’s bike that day. There were no such bolt available in the whole of Namibia, that was confirmed by the BMW dealers in Windhoek. So the people at the engineering works just made one out of high tensile steel. African ingenuity! 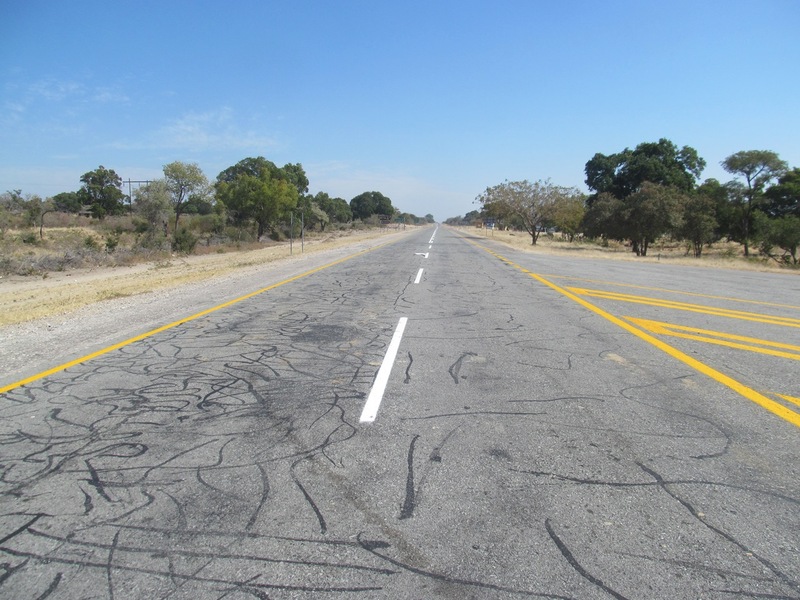 Meanwhile, the rest of us just packed up, and at a very leasurely pace started to find our own way to Rundu, just 2 hours away. I have thankfully stopped vomiting by then. But then the next calamity struck- I had another 2 days of hickups laying ahead, a reflux reaction after all the vomiting. It was not that good riding my bike, fighting a hickup every 5 seconds. 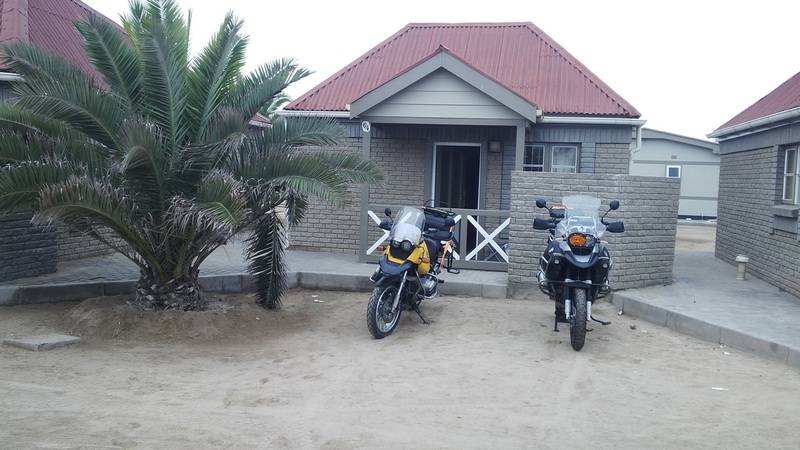 We arrived at Rundu, and after eating very little the past few days, I needed energy. We were happy to find a Wimpy at the Engen garage (filling station for you US friends…) And I had a beautiful doublethick milkshake. But the hickups just continued… so I went to find a pharmacy, and got some industrial strength medicine. 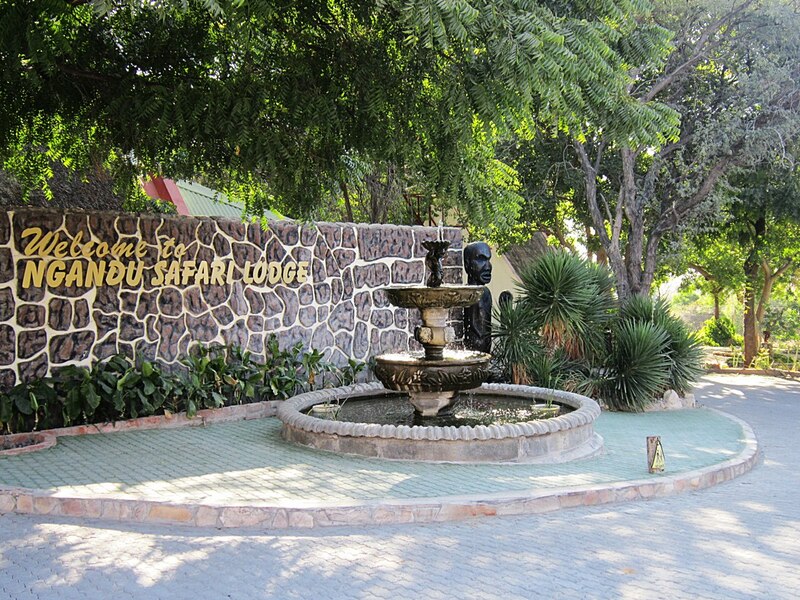 We camped at Ngandu Safari Lodge, which charged us about Nam$ 100 pp. 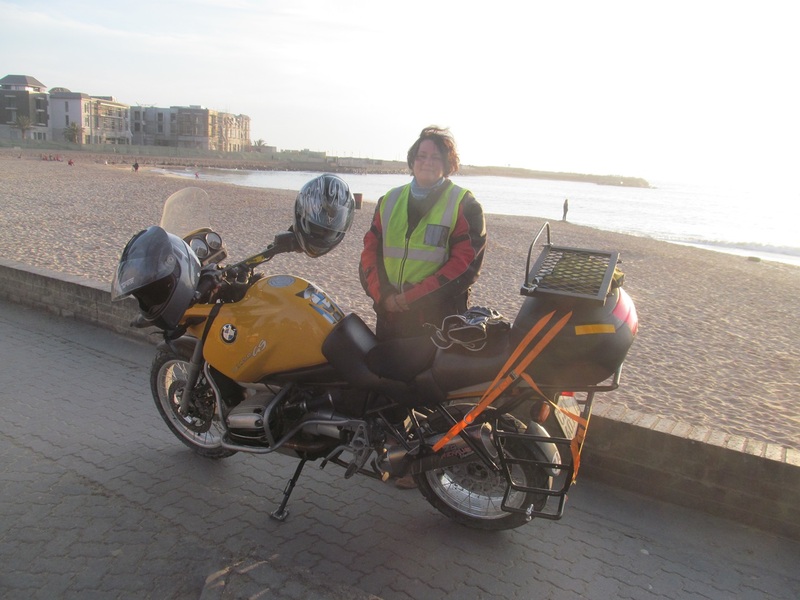 The wonderful news was that just after sunset Johan and Magda rejoined us, their bike fixed and ready for the next of the road. I again went to bed very early, feeling drained after the past three days of being ill. But I do remember that Elaine has cooked us some beautiful pork chops for dinner. 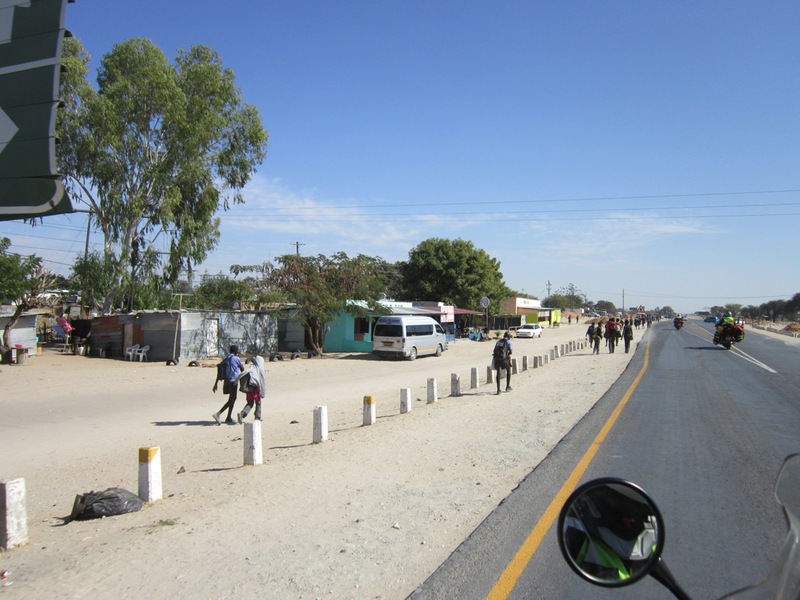 Rundu is a large town with about 65 000 inhabitants- the capital of this Kavango region of Namibia. There are at least 3 pharmacies in the main road, one at a three story medical centre. They also have some excellent shopping, with a brand new mall with Shoprite as the anchor tenant still being built. 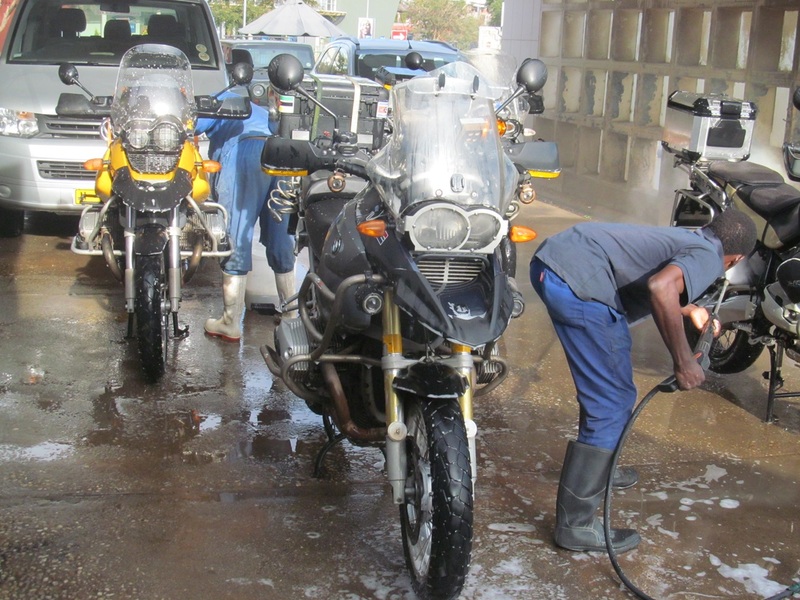 Camping at Ngandu was safe and on grass, there was just a hot water problem in the ablution blocks. I did manage a hot shower at the other side of the camping site, a small trickle of water at that shower. If the hot water problems can be fixed, this lodge will be good enough for most travellers not looking for luxury but affordability.